At Skulpt we open the doors to innovation. 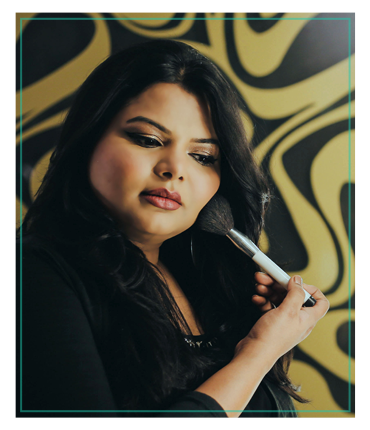 Learn from the successful makeup artists in the country and rub shoulders with celebrities. Our self-makeup courses in Chennai include party, bridal, fashion makeup and hair styling and hairdos. We have also included saree draping as per of the curriculum. We are an established academy for professional makeup in Chennai with adequate practical exposure. This real time experience our students gain with our clients has given them the confidence to step out in style. Looking to improve your career prospect? Want to penetrate the ever booming beauty slice? Want to know where to start? You are in the right place.Our beautician course for part-timers in Chennai can help you reach your ultimate goal without compromising on your current earning potential. Kick starting a career in the beauty industry is challenging. 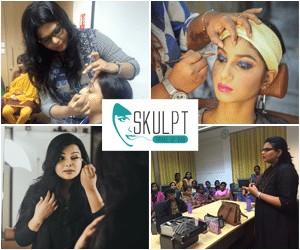 Our makeup school in Chennai guides aspirants to build their career with a stunning portfolio. We do not stop with just offering classes but also go a step further in providing aftercare with internships and workshops. Our makeup and grooming workshops help the students to keep in touch with what is trending in the field. The course is designed to convert a beginner into an expert. Personal makeup and grooming workshop is a two days weekend course to learn the fundamentals of makeup application. Nine-day advanced course in makeup is for professionals who want to hone their skills. Master the art of makeup with special emphasis on advanced makeup skills. Learn the intricacies of makeup art from the experts on a one to one basis. Airbrush technique is in great demand, and our three-day training offers a practical exposure to HD makeup. Your wedding day is coming ever closer, and you wish to turn the dream of a fairy tale wedding into a reality.